Today’s topic is the measurement of area and perimeter. Even though these may be considered measurement standards, they are highly connected to geometry (such as the attributes of a rectangle). 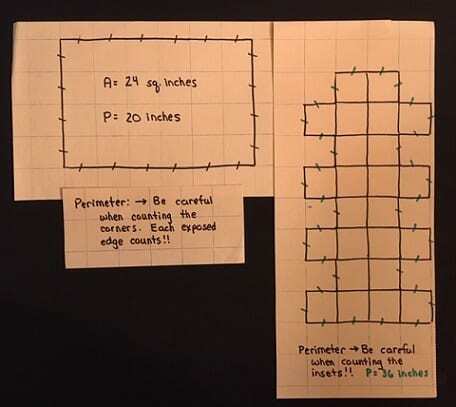 Check out previous posts in my Geometry series (Composing and Decomposing) for other mentions of area and perimeter. Misconceptions provide a window into a child’s thinking. If we know the misconceptions ahead of time, we can steer our teaching and directions to help students avoid them. I will go through several misconceptions and some strategies and/or lessons that might address them. Misconceptions #1-2 appear in this post. Misconceptions #3-5 will be featured in next week’s post. 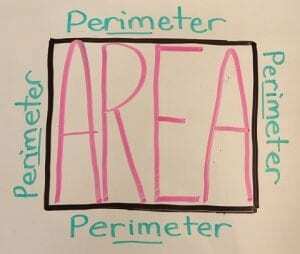 Problem: The student doesn’t know how to apply this definition to real situations which require the measurement of area and/or perimeter. Problem: Students confuse the two terms. 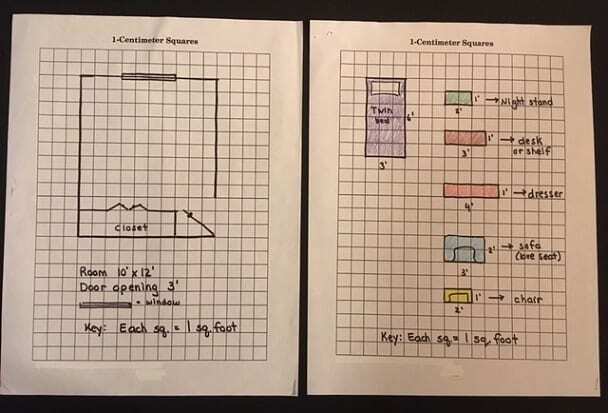 Brainstorm with students (with your guidance) examples of the need for area and perimeter. Use these scenarios as you solve concrete or pictorial examples. Area: garden, room size, ceiling tiles, carpet, rug, floor tiles, football field, tv screen, wallpaper, wall paint, etc. Perimeter: picture frame, fencing, floor trim, wallpaper border, bulletin board border . . .
Show this diagram which emphasizes the concept that area measures the entire inside surface using squares of different sizes (cm, inch, foot, yard, mile), while perimeter measures the rim / edge / around an object or shape usually using a ruler, tape measure, or string. 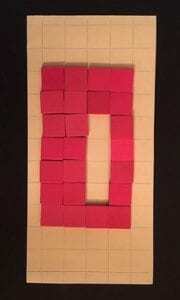 Try this project: Use graph paper and one inch tiles (color tiles) to concretely make shapes with a given area. Example, “Build a rectangle with an area of 24 tiles.” Specify there can be no holes in the rectangle — it must be solid. 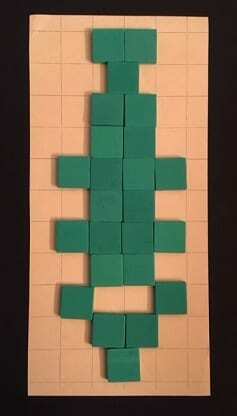 Students can experiment while moving the tiles around. Then trace the rectangle and cut it out. With this practice, students are also focusing on arrays and multiplication. Did they find 4 ways? (2 x 12, 3 x 8, 4 x 6, 1 x 24)? Did they find out a 3 x 8 rectangle is the same as an 8 x 3 rectangle (commutative property)? NO – this is not a solid rectangle. No holes allowed. Similar to the above: Use the tiles and graph paper to create irregular shapes with a given area – meaning they don’t have to be rectangular. Give the directive that tiles must match at least one edge with another edge (no tip to tip accepted). And, same as above — no holes in the shape. You can even assign different areas to each small group. 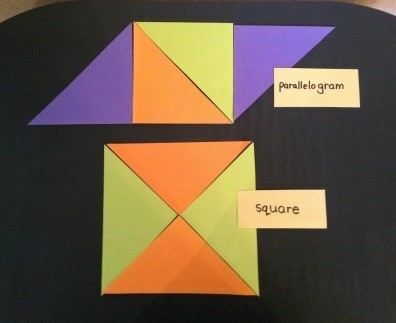 Compare shapes – put on a poster or bulletin board. 24 square inches. Each edge matches another full edge. NO – no holes or tip-to-tip allowed. A full edge must touch another full edge (not half as shown in the top and bottom). Using the same shapes made above, determine the perimeter. I suggest placing tick mark to keep track of what was counted. 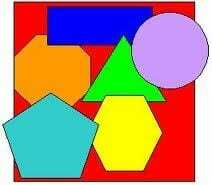 With this lesson, students will hopefully realize shapes with the same area do not necessarily have the same perimeter. Advise caution when counting corners or insets – students usually miscount these places. 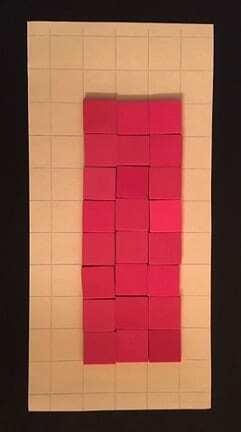 The student can use smaller scale graph paper with 1 square representing 1 square foot. Let them have time to “work it out” and practice perseverance as a rough draft before making their final copy. Together, use the square foot construction paper pieces to determine an appropriate size for a bed and other furniture. Students must think of it from an overhead perspective. When I did this with a class, we settled on 3 ft. x 6 ft bed for a total of 18 square feet. We did this by laying the square foot papers on the floor to see in real life what this size looked like. Label the Area and Perimeter of each item in the bedroom. The items in the bedroom could also be made as separate cut-outs and arranged / rearranged on the “floor plan” to see all of the different ways the room could look. Students in 3rd grade might want to use whole units, while 4th and up might be able to use half-units. Composing and decomposing 3D shapes should help your students become more familiar with their attributes. Here are a few activities to help. With emphasis on hands-on methods, examining real 3D shapes may help students find edges, vertices, and faces better than pictorial models. Nets of 3D shapes are the least expensive way to get a set of 3D objects in each child’s hand, especially since most classrooms just usually have 1 set of plastic or wooden 3D shapes. Build cubes and rectangular prisms using blocks or connecting cubes. Construct / deconstruct prisms using toothpicks, straws, coffee stirrers, craft sticks, or pretzel sticks as the edges. 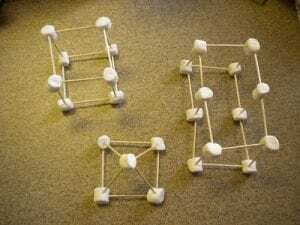 For the vertices, use clay, playdough, gum drops or slightly dried out marshmallows. 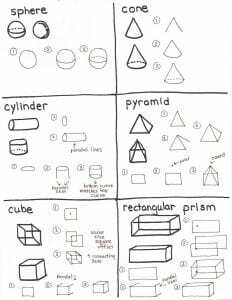 Teach students how to draw 3D shapes. When composing a 3D shape, a student becomes more aware of the 2D faces, the edges, and the vertices they are drawing. Plus, if needed the student can draw the 3D shape on paper to assist them if taking a computer based assessment. Here is my tutorial (below), but I’ll also include a couple of good websites in case you are 3D challenged. Click HERE for the pdf of the templates below. 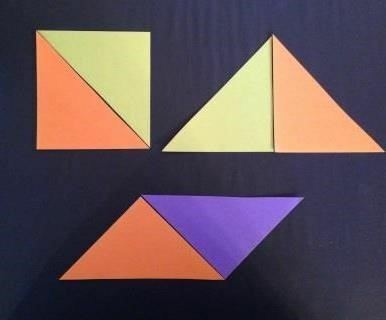 There are so many good ways to help students compose and decompose shapes (2D and 3D), so I will focus on some more by using tangrams and 2D paper shapes. In case you missed it, my last post focused on ways to use 1″ color tiles and pattern blocks to compose and decompose shapes. Click HERE to link back to that. 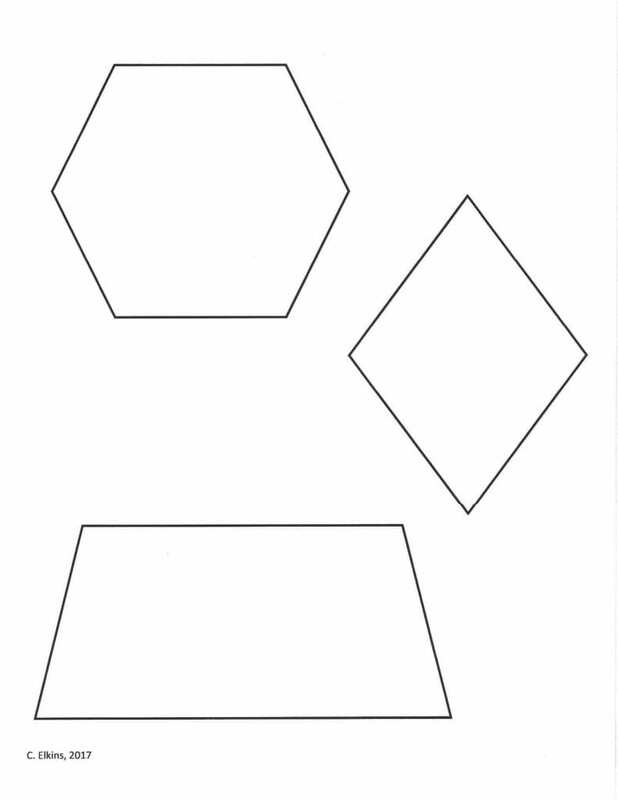 Give students paper shapes of these polygons: rectangle, square, hexagon, trapezoid, rhombus. Click here for a FREE pdf copy: Decompose and Compose Polygons. 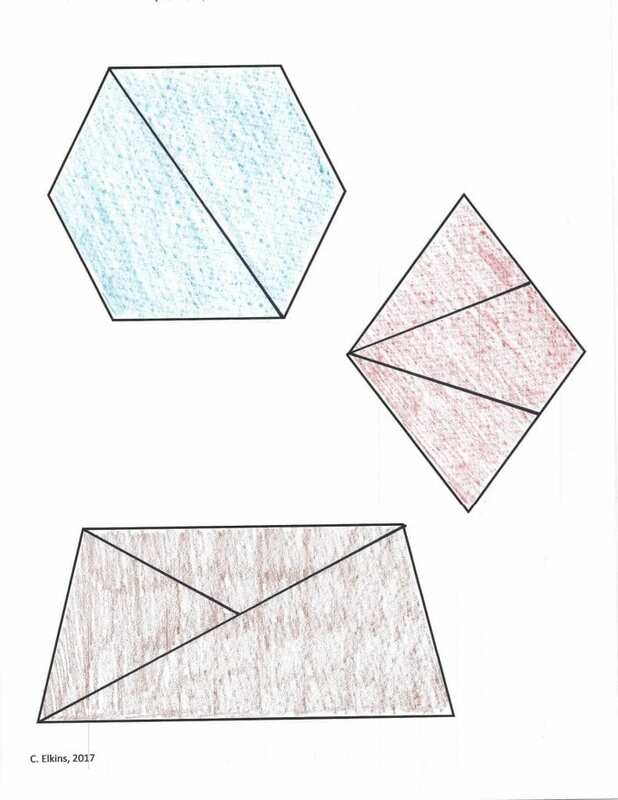 Students should color each paper shape one solid color (a different color for each shape). My advice is to use light colors because they will be drawing lines on the shapes and light colors enable them to see the lines. Model how to draw 1 or 2 lines to decompose the shape into smaller shapes. 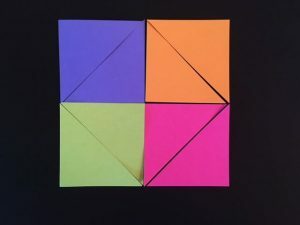 For first and 2nd grade, I recommend you show them how to use at least one corner of the shape to connect to another corner or side using a straight edge or ruler. This way the newly created shapes will resemble ones they already know (triangle, trapezoid, rectangle). 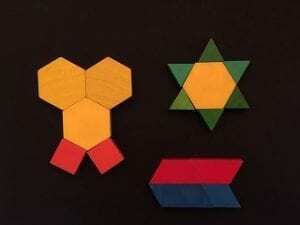 Older students can be given a little more leeway — their decomposing may result in other more irregular polygons. Here is one way to decompose. Cut apart on the lines. Have students put their initials or name on the back of each piece (in case it gets separated or ends up on the floor). Each student puts their cut-up pieces in a baggy for safe-keeping. Then the student can take them out and try to compose them back into their original shapes. This is where the color-coding comes in handy (all the yellow go together, all the green, etc.). 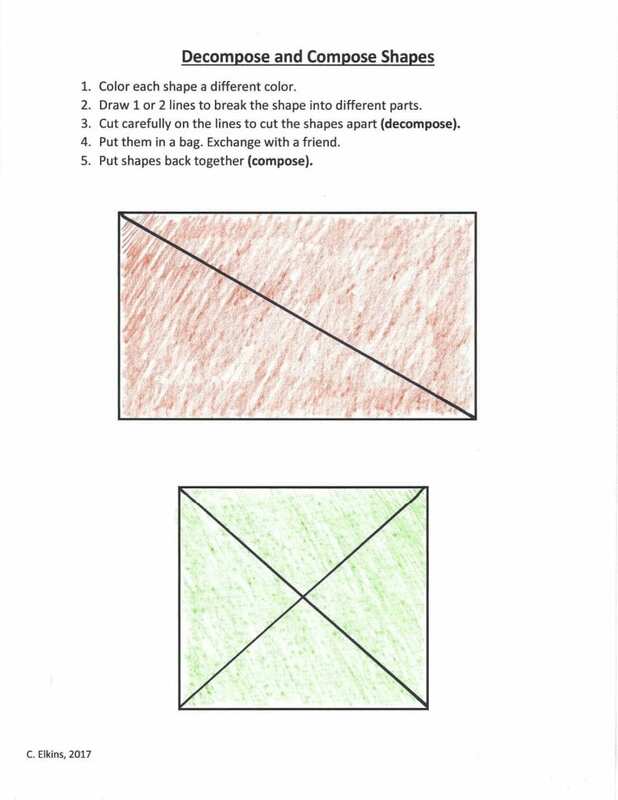 Students can trade their baggies with others to compose their shapes. 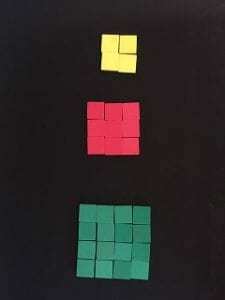 When students are done with the shape puzzles, they can glue them back together on background construction paper (or take them home for practice, or keep at school for ongoing work). Discuss together how many different ways these shapes were decomposed using 1 or 2 lines. Composing and decomposing geometric shapes (2D and 3D) should be centered around concrete and pictorial methods. In this and upcoming posts, I will illustrate some methods using various manipulatives and line drawings which help students take a shape apart or put shapes together. If you refer back to Geometry Part 1: The Basics, all grade levels KG-5th have standards dealing with this issue. Some of the experiences I plan to share will also help students relate to multiplication, division, fractions, area, and other geometry concepts (such as rotations, reflections, slides). Refer to Geometry Part 2: van Hiele levels to determine if the activities you are choosing are appropriate for Level 0, 1, or 2 students. 1. 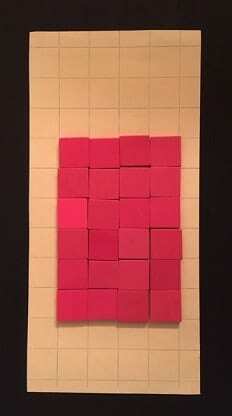 Can you make a larger square out of several individual squares? Level 0 students will be using the visual aspect of making it look like a square. Level 1 students will be checking properties to see if their squares are indeed squares (with the same number of tiles on each side). 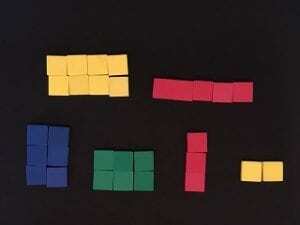 Level 2 students will be noticing they are creating an array (ex: 3 x 3 = 9) and perhaps learning about squared numbers. 3 squared = 9. They might be able to predict the total number of tiles needed when given just the length of one side. 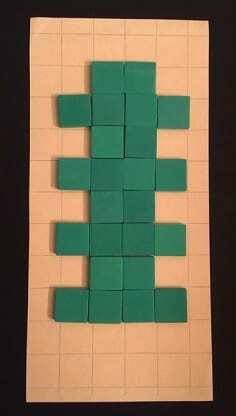 Level 1: Are the green and blue rectangles the same size (using properties to determine)? Today’s post will focus on an aspect of geometry involving levels of thought. We know PreK or KG students aren’t ready for formal definitions regarding shapes. 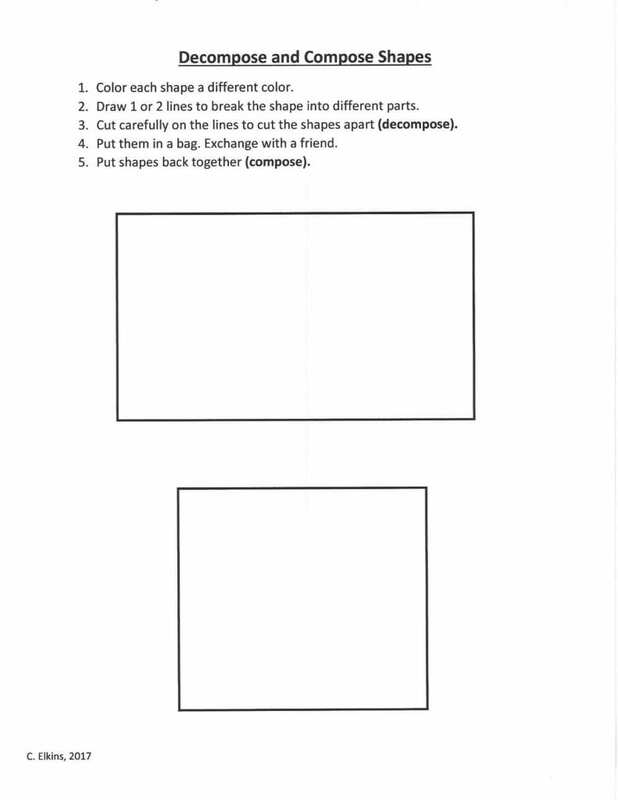 Starting about 2nd grade, students might be ready to describe shapes using specific attributes. Pierre and Dina van Hiele are Dutch math educators who have an excellent way to describe how children move through these geometric thinking levels. They are called “The van Hiele Levels of Geometric Thought.” Click on this link for a full description: The van Hiele Model Also – some good resources at the end of this post. What can we as teachers do to help them move through the levels? According to van Hiele, the levels can’t be skipped – children must progress through each hierarchy of thought. So while there is no grade level attached to these levels, I like to think of the Visualization Level as the beginning point most appropriate for PreK-1st or 2nd grade students. Level 1 thinking might surface in grade 2 or 3 (and up). Students capable of Level 2 thinking may start with 3rd – 8th grade. Students in high school geometry might function at Level 3 thinking. One of the properties of the levels he described has the name of “Separation.” The article linked above states: A teacher who is reasoning at one level speaks a different “language” from a student at a lower level, preventing understanding. When a teacher speaks of a “square” she or he means a special type of rectangle. A student at Level 0 or 1 will not have the same understanding of this term. The student does not understand the teacher, and the teacher does not understand how the student is reasoning. The van Hieles believed this property was one of the main reasons for failure in geometry. Teachers believe they are expressing themselves clearly and logically, but their Level 3 or 4 reasoning is not understandable to students at lower levels. Ideally, the teacher and students need shared experiences behind their language. Lack of practical experience? Not all homes have materials or provide opportunities for students to apply their knowledge (like blocks, Legos, measuring cups for cooking, tape measures for building, etc.). Background knowledge about the size of actual objects? We take it for granted students know a giraffe is taller than a pickup truck. But if students have not had the chance to go to a zoo, then when they are presented a picture of the two objects they might not really know which is taller / shorter. Think of all of the examples of how we also expect students to know the relative weights of objects. Without background knowledge or experience, this could impede them regarding picture type assessments. Standards keep getting pushed to lower grades when students may not have reached the conservation stage? If they think a tall slender container must hold more than a shorter container with a larger diameter, or they think a sphere of clay is less than the same size sphere flattened out, they may have difficulty with many of the geometry and measurement standards. KG: Recognize and sort basic 2D shapes (circle, square, rectangle, triangle). This includes composing larger shapes using smaller shapes (with an outline available). 1st: Recognize, compose, and decompose 2D and 3D shapes. The new 2D shapes are hexagon and trapezoid. 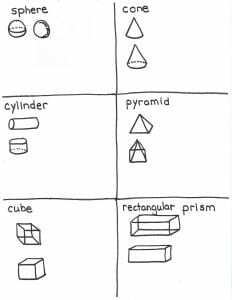 3D shapes include cube, cone, cylinder, sphere. 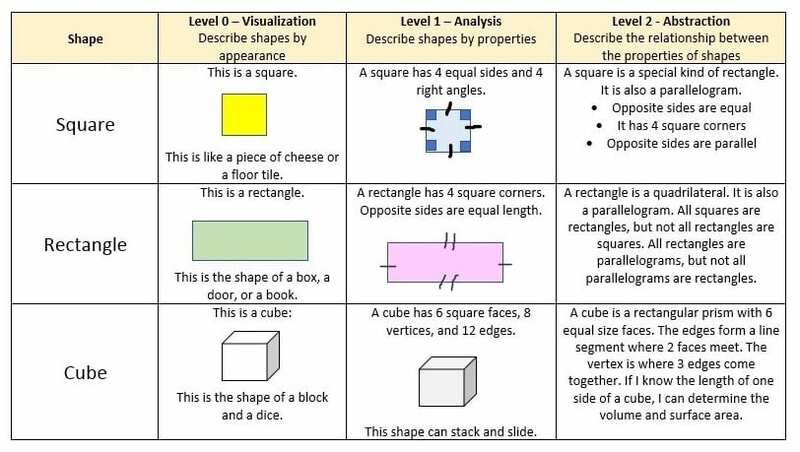 2nd: Analyze attributes of 2D figures. Compose 2D shapes using triangles, squares, hexagons, trapezoids and rhombi. 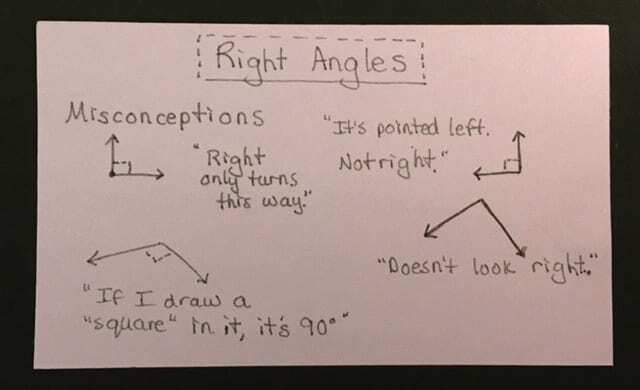 Recognize right angles and those larger or smaller than right angles. 3rd: Sort 3D shapes based on attributes. Build 3D figures using cubes. 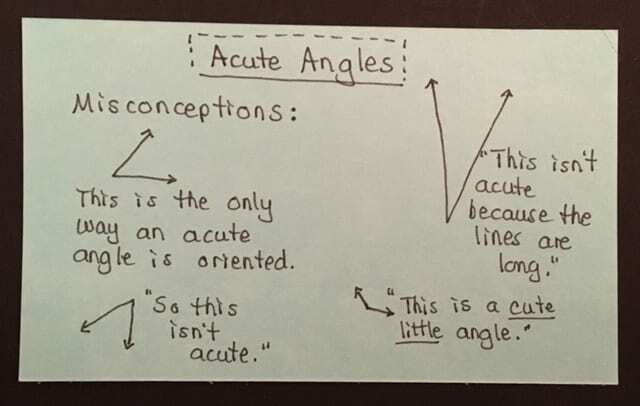 Classify angles: acute, right, obtuse, straight. 4th: Name, describe, classify and construct polygons and 3D figures. New vocabulary includes points, lines, segments, rays, parallel, perpendicular, quadrilateral, parallelogram, and kite. 5th: Describe, classify, and draw representations of 2D and 3D figures. Vocabulary includes edge, face, and vertices. 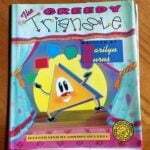 Specific triangles include equilateral, right, scalene, and isosceles. 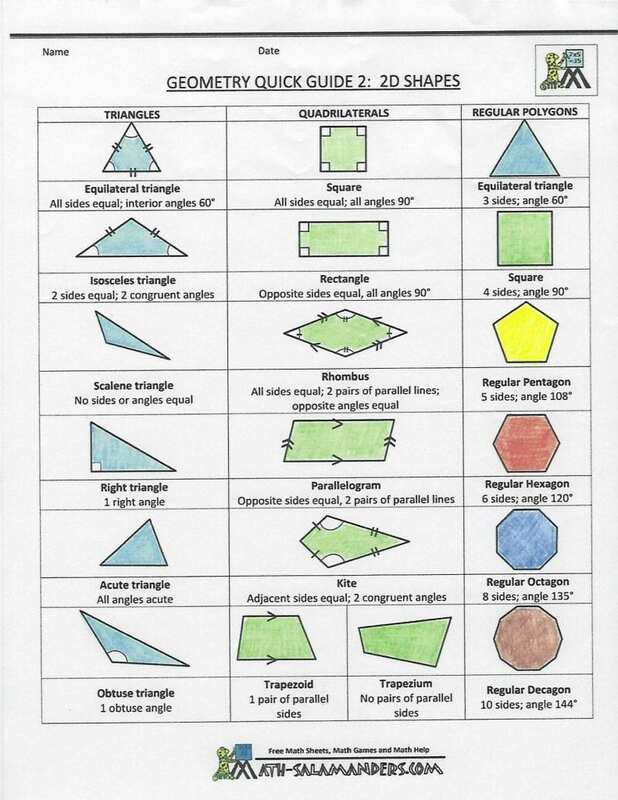 Here are a couple of guides that might help you with definitions of the various 2D shapes. The 2D shapes guide is provided FREE here in a PDF courtesy of math-salamander.com. I included a b/w version along with my colored version. 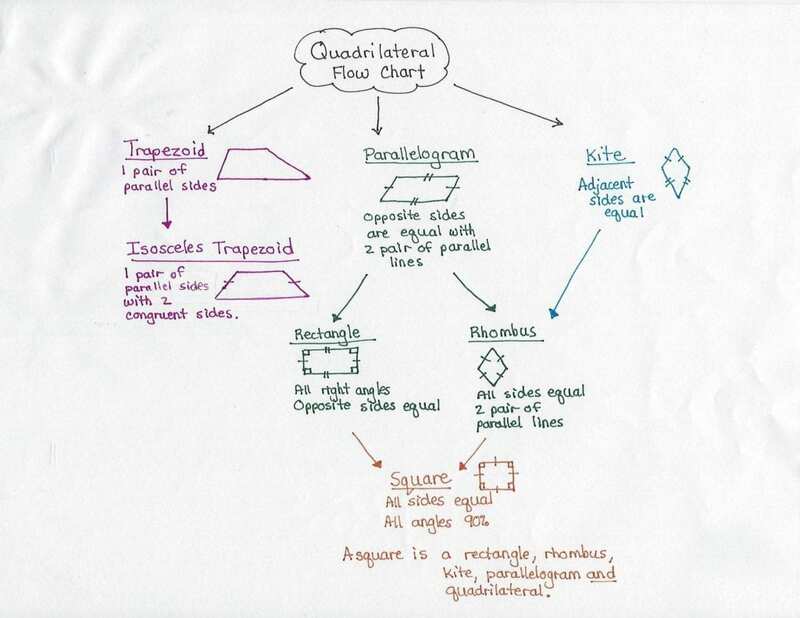 The Quadrilateral flow chart I created will help you see that some shapes can have more than one name. Click on the link for a free copy (b/w and color) of the flow chart. Read below for more details about understanding the flow chart. This is a math resource I absolutely love! 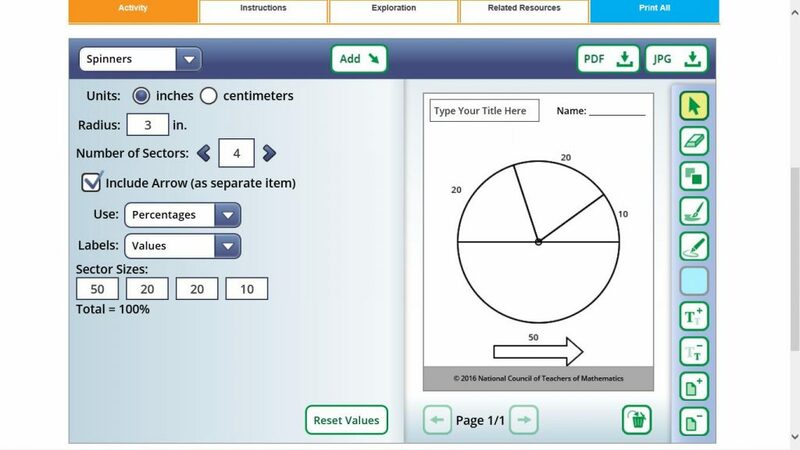 It is a product of the National Council for the Teachers of Mathematics (NCTM). This site includes lesson plans and interactive activities. Search in several ways: by topic, by standard, or by grade level. Need some strategy games? Check out “Calculation Nation” (some of which can be played against other players), and “Brain Teasers.” I have just added this link to my Resources page (on my blog home page). Dynamic Paper: Customize graph paper, number lines, spinners, nets, number grids, shapes (to include pattern blocks, color tiles, and attribute blocks), and tessellations. You can also choose inches or cm. These can be customized, saved and printed as jpeg or pdf. I created the spinner shown here. Five Frame and Ten Frame tools: Geat activities to build number sense using five or ten frames. These may take 1-2 minutes to load. Cubes: Build a rectangular prism one cube, or row, or layer at a time and then compute the volume or surface area. Coin Box: Drag and exchange coins. There is also a feature I like (the grid at the bottom right corner), which puts coins in blocks (by 1s for pennies, 5s for nickels, 10s for dimes, and 25s for quarters). This really helps see the value of the coins. Want more info about coin blocks? Once on the Coin Box page, click on the “Related Resources” tab. Equivalent Fractions: Build different fractions in circular or rectangular format. Compare them and see them on a number line. You can manipulate the numerators and denominators to see fractions change right before your eyes! 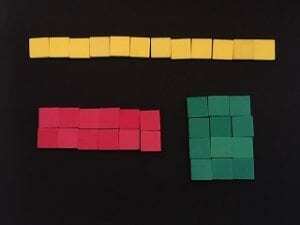 Others for fractions: Fraction Models (which includes decimal and percent equivalencies) and the Fraction Game. Geometric Solids: Create a shape (either transparent or solid) and swivel it around to see all of the faces, vertices, and edges. For your graphing needs, check out the Bar Grapher, Circle Grapher, and Data Grapher. With these tools you can create graphs using any of your own data. Some of these need Java installed. Enjoy these and so many more!!! Let us know if there are others you recommend.